Have you ever made a hot cocoa recipe with 34 ingredients <cough America’s Test Kitchen cough> because you thought “This must be the best cocoa ever!”…only to discover half an hour and many lost ingredients later, you would’ve just preferred a nice little packet of Swiss Miss? This has been the story of my life. Until now. It all starts with a recipe for something you can easily keep on hand in the pantry: vanilla sugar. 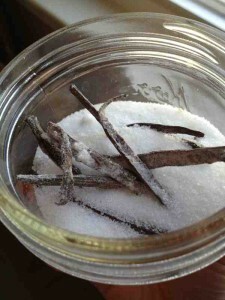 Bury your vanilla bean(s) in a small jar of sugar. In a week or so, the bean will provide a wonderful fragrance and taste. Use it anywhere you’d normally use sugar. Top off jar with fresh sugar as needed. Now that you have your Secret Vanilla Sugar Weapon, you’re ready to make some cocoa! Measure out 8 oz. (1 cup) of milk. Pour about a tablespoon into your mug. Heat the remaining milk on the stove to desired temperature. While milk warms up, mix your sugar, cocoa powder and spices into the mug to moisten. (I added some baking spices that I received as a gift, but the spices didn’t help the flavor, in my opinion.) Carefully pour your hot milk into the mug, stir and top with whipped cream or marshmallows. Now wasn’t that just as easy as Swiss Miss? And it tastes better, too! 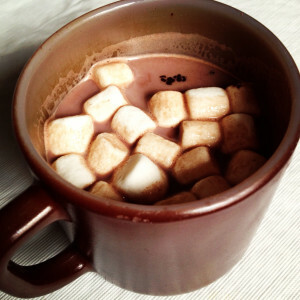 Do you have a favorite hot cocoa recipe? only 1 Tbsp sugar & cocoa each? i feel like i’d need at least 3! Yes, Liv! It was perfect for me, but adjust to your taste.